June 2012 – He Said What?! Aaron’s been grouchy lately, which makes me extra irritated with him. I actually have been pretty tired of Aaron the last few days. I hope that doesn’t disappoint anybody but it’s true. His attitude leaves a lot to be desired right now………..and this affects my attitude, leaving me with much to be desired in the attitude department as well. I had been out in the garden today and lost track of time. Realizing that I needed to check on Aaron and ask him about lunch, I went up to his room to offer him some lunch. He finally came downstairs, still carrying that attitude, so I was pretty brusque and unhappy myself. This made him calm down and be contrite. After all, food is in the balance here. His attitude improved greatly at the magic words……….Kentucky Fried Chicken. That smacks of eating out………..of restaurant food……….of anything other than what Mom makes. Aaron’s not been picky as he’s grown up, but now that he’s gotten more of a taste of eating out, he does indeed love it! He decided that he could handle the bones in KFC chicken and so that matter was settled. I went outside to do something and when I came back in the kitchen, Aaron was polishing off an ice cream bar. I walked by the side of the kitchen table, and lo and behold…………there were two more ice cream bars on the chair. He thought they were safely out of sight, but Mom’s eyes are sharp for these things and his plan for three ice cream bars was foiled. I did compromise and let him have one more, but not two more. He knew a good turn of events when he saw it and so didn’t press his good fortune. There he goes, warming my heart with his clever use of language. I paused when he asked me this question to be sure I heard him correctly, and so he repeated it……….”Does the face around me have chocolate?” And he gave a little laugh……….I’m not sure why………..and I smiled and told him that his face was clean. He thumped on upstairs to take a nap, leaving me with that awareness again that no matter how irritated I am with him, he will somehow manage to make me smile and to keep me sharp with his amazing way of talking. I well remember when the kids were little and days were exhausting and stressful. There were times that I would smile at something and realize that I had not used those muscles all day. What were my children having to see when they looked at me all day? Smiling has a way of breaking the ice off my heart………..an outright laugh is even better. And it certainly may improve the disposition of those around me. I know that on many days and on many occasions, I need to be aware of the face around me – my OWN!! We hadn’t seen Kristi in four years and were looking forward to having her come for dinner and fellowship. Catching up on life and hearing about her missionary work in France was going to be the order of the evening. I had my menu planned and knew the order in which I needed to prepare the food so that it would all be done right on time. 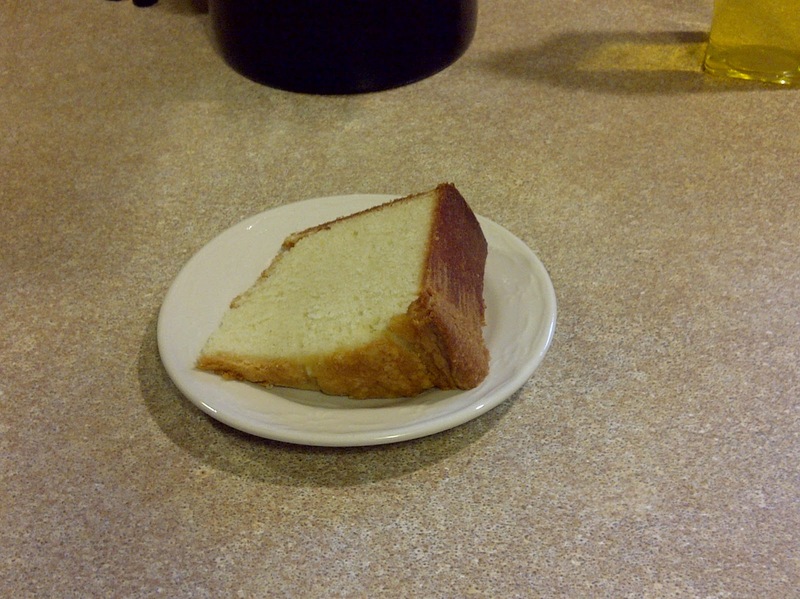 The first item to prepare was the homemade Pound Cake that I would later serve with ice cream and chocolate syrup. I love to have my house smelling like good home cooking when someone comes to visit, and I knew that this Pound Cake would start off that homey smell just right. After the cake was in the oven for awhile I noticed that I wasn’t smelling that wonderful aroma that I had looked forward to experiencing – and neither would Kristi when she walked in the door! All I was smelling was the acrid, offending odor of burnt cake. How could that be? So I turned on the oven light, peeked in through the glass door, and quickly found the cause. 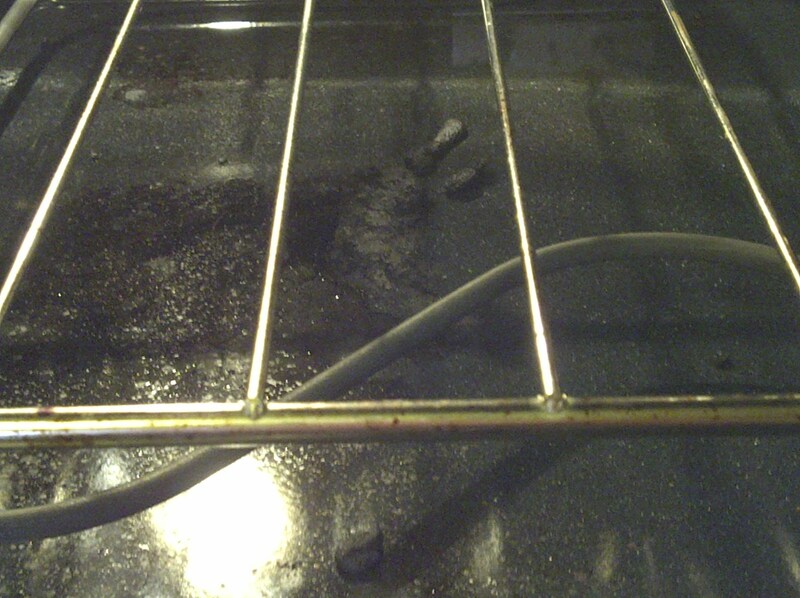 There on the floor of the oven was an ugly mound of burnt cake batter. Somehow some of the cake had oozed out of the tube pan onto the bottom of the oven and proceeded to bake into a black, ugly glob. I couldn’t open the oven door to remove the offense because then the cake would fall, so I had to let it continue baking and filling the house with its burnt odor. I wasn’t smelling my wonderful Pound Cake. Instead, all I whiffed was the burnt glob on the bottom of the oven. Later, I put the Ravioli Lasagne in the oven and in my hurry to get it started I decided not to remove the burnt batter. I thought that it had surely burnt so much that it wouldn’t smell anymore and so I would take care of it later. But sure enough, as the lasagne began to bake I could only smell the dark smell of something burning. It wasn’t until I opened the oven door and gingerly scooped out as much of the glob as I could that the smell began to go away and to be replaced by the delicious scent of lasagne and cake. I wonder what aroma I emit when I am around others? I’m not talking about the scent of my lotion or whether I brushed my teeth. Paul said it so well in II Corinthians 2:14 – “But thanks be to God, Who always leads us to triumph in Christ, and manifests through us the sweet aroma of the knowledge of Him in every place.” Am I manifesting the sweet aroma of Christ to everyone that I am around? Sometimes I know that I have let the hardness of life burn me to a crisp. When I allow life’s situations to burn me instead of bake me to perfection under His guiding hand, then I emit a very unpleasant odor. How I respond to the disappointments I face will determine whether I’m allowing Christ to make me into what He wants or allowing my own sinful nature to ooze out of my mouth and my attitudes. Satan loves to bombard us with discouragement and to heap guilt and blame upon our heads. God wants us to live in truimph, as Paul said, and to rest in the knowledge of Him. My knowledge of God leads me to know that even in the very, very difficult periods of life, He is mixing the ingredients of my life into just what He wants me to become. Oh may I not allow that beautiful mix that He is creating to become a burnt glob of bitterness and doubt! May I manifest through Christ the sweet aroma of the knowledge of God in every place that I go! When Aaron had his teeth cleaned a couple weeks ago, the dentist found a large crack in one of his back molars. This explained the pain that Aaron had been having since biting down hard on some steak a few weeks prior to this discovery. Dr. Baxter, our dentist, said that Aaron would need a crown. Aaron has talked and talked about his broken tooth, his cracked tooth, his sore tooth – and also talked of his crown, wondering if it will be silver or gold, and just how the whole process will transpire. I assured Aaron that she was not a servant, but was a dental hygienist who worked for Dr. Baxter. I was hoping that he would not ask her today about her servant status. She was polite and smiling after Aaron’s prep work was over, so hopefully he wasn’t offensive in any way. One good thing about dental visits is that Aaron has very little talking time there. Now I had already told Aaron that lunch was questionable due to his numbness that was sure to come. He was still hoping for a miracle. I had to tell Aaron to hush as I made his next appointment and his Pizza Hut question kept being repeated. The hygienist gave him a coupon for a free ice-cream cone, so the pizza question then became an ice-cream cone question. We made our usual post-dental Wal-Mart visit. 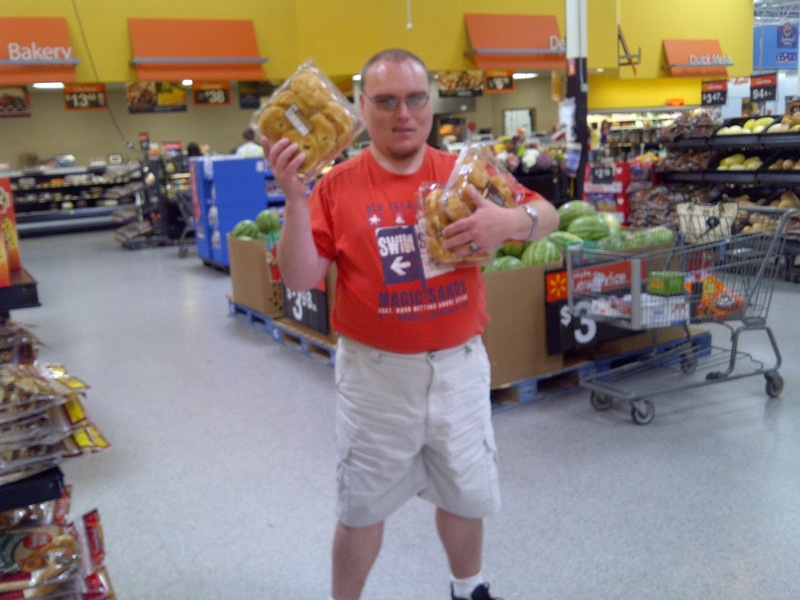 I had my list ready and Aaron had his usual stops all planned: Bathroom………Snack Aisle………..Video Aisle. I looked up from housewares to see him lumbering toward me, balancing three canisters of his now favorite Multi-Grain Sour Cream and Onion Pringles in his arms. We put them in the cart and he was off again, only to return soon after with a DVD in his hand. It’s a DVD that I’ve said no to in the past but Aaron is ever hopeful. The answer was still no. He heard the stern tone of my voice and knew that his Multi-Grain Sour Cream and Onion Pringles were in jeopardy if he responded incorrectly, so he was mellow about not buying the DVD. He did try for a new keyboard…………..with another no from me…………..and a new desk chair…………..and another no………..and a travel neck pillow that he always wants………….with yet another no. But Aaron wasn’t finished. He asked about the spaghetti I told him we were having for supper, wanting to know about bread. Before I could answer, he asked if we could have some………….can you guess? Croissants!! I surprised him by saying yes, and then told him to go get his treasured Croissants while I picked up one more thing. Soon I headed toward the deli breads, only to see Aaron once again lumbering toward me with – of course – THREE containers of Croissants. He had planned his argument well, telling me that he could have some for breakfast, too! He was so hopeful and was balancing the containers so carefully, that I caved and said yes. Happy, happy Aaron! He sat on the bench outside his favorite nail salon while I paid, with strict instructions from me to NOT stand in the door staring at the women getting their nails done. I forgot to mention not clapping, and soon I heard that familiar, ear-splitting CLAP!!! He was looking right at me, knowing that my head would shake no and my mouth would form a silent no. He smiled his lopsided, numb-faced smile. Good old Aaron! We both know exactly what to expect from each other, though sometimes there are surprises. Aaron’s surprises today came in threes with his three Pringles and his three Croissants. For me, it was the surprise of seeing Aaron with his three containers of Croissants. I thought he would have figured out how to stack them and carry four or five, at least! We talked about that awhile, and he wanted to know about why each verse has different words…………come to Jesus, sing to Jesus, fall on Jesus, etc. We discussed the fact that this song shows the various stages of our Christian walk and then death at the end. It was a sweet almost-ending to our day. Oh, come on Gary! Let’s show Aaron what it means to make some music together!! It’s been one of those mornings. You know……..one of THOSE mornings. I went to bed bothered by worrisome issues that I should not go to bed being bothered by……….those worrisome issues. Can’t end that sentence in a preposition. 🙂 I went to my new location in Andrea’s old room that I’ve set up for myself……..a new desk and an alone place to have my quiet time. The new location didn’t seem to help. I felt stifled and ineffective in my time with the Lord this morning. Distracted…….and thinking that I needed to dodge my prayers that were bouncing off the ceiling, going no where. Is Satan unhappy about my desire for a more intimate time with the Lord? Perhaps. Later, I looked at the weather forecast and the upcoming week of temps above 100 and no rain only increased my weariness. Our scratchy dog with allergies; laundry waiting to be washed or put away; dishes to take care of; even a Supreme Court ruling and an election in Egypt that I don’t agree with were piling up in my mind. Talk about taking on the cares of the world. Come on, Patty. This is really ridiculous! After my shower, I heard good old Aaron in the hall. “Mom?” I told him that I would be out in a minute. I could tell that I would have very little patience with him today………shame on me. He thumped downstairs to take his pills and thumped back up to see if we could now talk. I again told him to wait……….and when I did open my door, he was in his room and promptly told me to come look at his finger. He held it up for me as I walked in, and there it was………….his index finger, all wrapped up in a bloody band-aid. My patience was even less now. “Mom, last night I had some loose skin and so I used my knife to cut it off.” Oh Aaron. We’ve heard this story before and I knew what was coming………..and it did. He wanted to know if he should have used his little pocket knife to cut off the skin; why not? ; what would I use? ; that he couldn’t help it that the knife slipped, etc., and etc. I removed the band-aid and saw the raw wound where he had cut or pulled off his loose skin. I could feel my irritation increasing. I told him to go shower…………his whole body, by the way, not just his finger! I know how he thinks. Then I saw the spill, which looked more like a gushing of coffee. It was splattered on several stairs, but one stair in particular was soaked with coffee. Oh Aaron! Look at this mess! Next I saw coffee on the living room floor, so got the Swiffer and mopped that section. I headed for the soppy stairs, with Aaron saying, “I’ll clean it up, Mom!” But I grabbed towels and began the clean-up, while Aaron then said, “Here, I’ll help.” He proceeded to carry a wad of paper towels from the kitchen into the living room and instead of heading for the stairs where I was, he started wiping off the piano. WHAT??!! Sure enough, some coffee had splattered onto the piano and Aaron was working to clean up the brown spots…………….while he stood on the still-wet floor. I went from unhappy to unhappier, all the while muttering about how my nerves couldn’t take much more and of all mornings and please, Aaron, don’t talk right now……….. I continued my shallow thinking as I realized that I would indeed have a bad hair day, no matter what I did to try to improve the mess on my head. The clothes I chose to wear today didn’t help any, nor did the sandals. No time to change all that now. Of all days for me to have a doctor appointment, I moaned to myself. Little annoyances for the remainder of the morning reminded me of my misery. Aaron and I hurried out the door, stopping at the grocery store on our way to meet his group. I had promised him a Cheddar Pasta Salad to take to his group. Of all mornings to need to leave early, I grumbled. I had to pause in my heart and smile. As we drove to meet his group, I told him that I was sorry about my attitude that morning. He didn’t say a word, but I know he filed that apology in his mind. I needed to say it and he needed to hear it from his grouchy mother this morning. Later, at Sassy Nails, I sat across from a stranger – another mom – while our toes dried. We talked and she shared how her sister had died of cancer, and how through it all she had blessings to be thankful for. This woman, this mom, this sister, had no idea about how much I needed to hear those words. How easy it is to let the slight troubles of my life ruin my disposition and take my mind off the Lord! 1. The spilled coffee matches the carpet, especially in the dim light. 2. A coffee smell on the stairs beats a dog smell any day. 3. The living room needed to be mopped anyway. 4. My new pink toes hopefully took the doctor’s eyes away from my bad hair. 5. I do have hair. 6. It may be 107 degrees outside, but we have working AC inside. 7. It may be 107 degrees outside, but I don’t have to be outside working. 8. 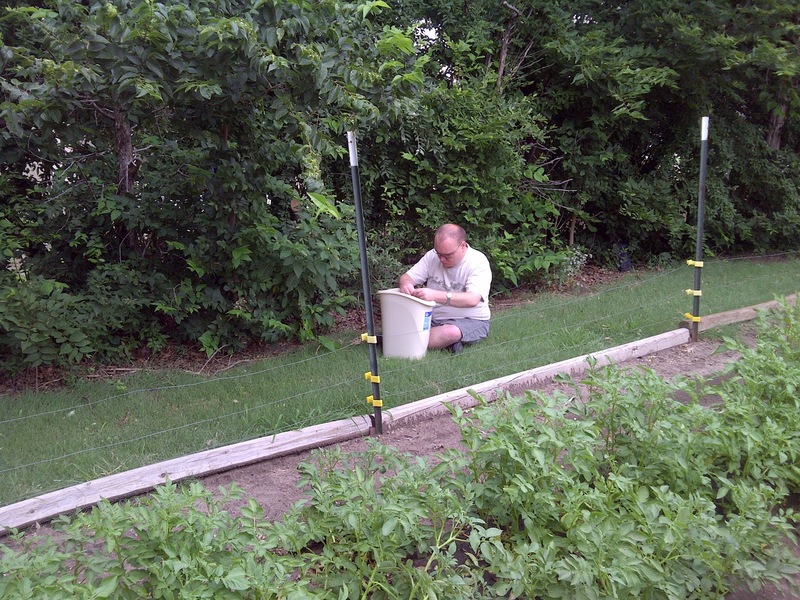 It may be 107 degrees outside, but we have water for our thirsty garden. 9. Our neighbors have to move for various hard reasons, and the man taking pics of their house this morning wasn’t taking pics of our house. 10. I have a faithful God; loving husband and children; and Aaron to remind me of what’s important. And I have forgiveness – God’s forgiveness – and even Aaron’s forgiveness……..unspoken but there none the less. Author hesaidwhatksPosted on June 25, 2012 April 9, 2017 Categories Adult Autism, Apology, Blessings, Burdens, Children, Contentment, Empty Nest, Faithfulness, Family, Forgiveness, Patience, Peace, Relationships, Special Needs Adults, Thankfulness, UncategorizedLeave a comment on Count Your………Our………..MY Blessings! Aaron came home one day last week, bounding in the door in his usual bounding way. Immediately I heard his routine, “Mom!” He continued to call my name as he made the rounds of the house until he found me. It never fails. Not that he finds me………..I can’t hide that well. It never fails that he calls “Mom!” repeatedly throughout the house. I have told him over and over to quit yelling out “Mom!” but to wait until he finds me, and then he can say “Mom” and proceed with his tall tale or his question or his observation or his question………..quietly. This is foreign and unacceptable to Aaron, obviously, so I just waited as he yelled “Mom!” and then as he walked in my bedroom I proceeded with my hello and how are you………none of which he was interested in at the moment. He waited for my response, to be sure I was listening or interested…………not sure which. What were you wondering about today, Aaron? Aaron, why do you want to call your dad and I by our first names? So proceeded our evening conversation, continuing throughout supper preparation and throughout our time of waiting for Dad (aka Gary) to return home from work. Aaron could not really define why he was tired of calling Gary and I by our usual titles of Mom and Dad. However, he assured us that he was very tired of the Mom and Dad routine, and that Gary and Patty would suit him so much better. Of course, Gary agreed with me because I’m Mom (or is that Patty?). He told Aaron that he should not call us by our first names but by our titles of Mom and Dad. We struggle enough with instilling respect for others in our very vocal Aaron. We both tried to make him understand that calling us by our first names would be showing a lack of respect. I don’t know why we thought that this would matter to Aaron. Since when is it weird to call Mom and Dad…………Mom and Dad? Aaron couldn’t quite answer that question. I tried a different approach as I told him about given names and that his given name is Aaron, my given name is indeed Patty as well as his Dad’s given name is Gary. BUT our title to our children is MOM and DAD. Author hesaidwhatksPosted on June 22, 2012 Categories UncategorizedLeave a comment on Who Am I? Today has been a stay-at-home day – for both Aaron and me. Aaron slept late and when I went in his room to check on him, he said his stomach hurt. I didn’t hear any seizures but knew that he didn’t feel well. Or did he just go to sleep late last night and so wanted to sleep in? I’m not at all sure about the reason he didn’t feel well, but I made the decision to let him stay home from his day group today. The decision was easier, too, since I was going to be home all day, and so I didn’t have to rearrange my schedule in order to be here with him. Aaron, I know you don’t feel well. You really do get to stay at home today. Yes, Aaron, that will definitely be good for you……….and VERY good for me. Now go! Good grief, Aaron! For those of you who may not know, a 52 slushie means a 52 ounce slushie. The biggest……….the largest………..the extra grande………..the one that Aaron always buys. “They have a 52…….a 16………and a 32,” he replied. So I told him that a 16 would be far better………as would ONE box of Hot Tamales………NOT four! “Why is a 16 a good size?” he wanted to know. Because a 16 is plenty, Aaron. A 52 is WAY beyond plenty! I smile. No matter how many times we tell Aaron not to refer to skin color, he invariably comes back to that – or some other – physical feature to describe someone whose name he can’t remember. We worry about him being offensive………a concept he does not grasp nor does he care to. 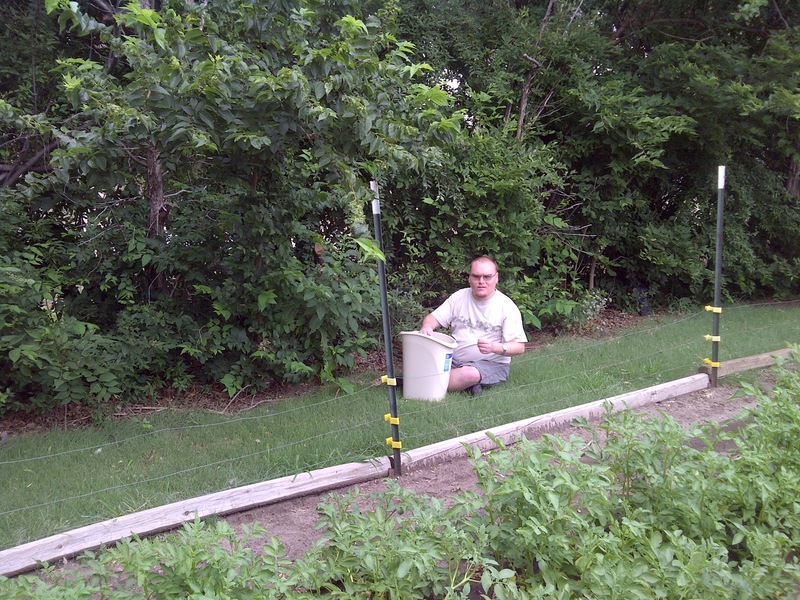 I went outside to work in the garden and to trim some bushes. I enjoyed the fresh air, the birds, the sound of the wind………….and then, “Mom!” There stood Aaron, wondering where I was and what I was doing. I invited him to come out to join me and to talk…………not believing those words were coming out of my mouth! Aaron does not need an invitation to talk. He manages that very easily, like breathing. Yet on this morning, as Aaron came back outside with his shoes and socks on, carrying his trash can…………..he did not talk. He busied himself in the dried leaves and grass and twigs on the back side of the garden. 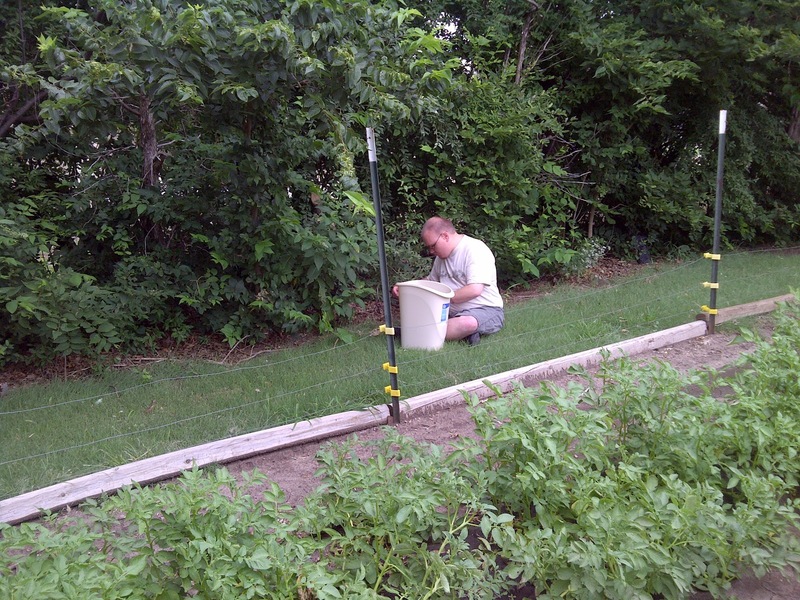 When he absorbs himself in this activity, he is lost in thought………….relaxing in his own world. This is one world that we are not a part of…………….a place where only Aaron goes. Even my comments about the beans or the clouds or the wind or the lady bugs did not elicit a response of more than a grunt or a word or two. One, Aaron. One is plenty. Not a 52, or 16, or 32…………or 4, like the Hot Tamales. Simple, yet profound. He remembers that we pray before we eat at home, and when we are out. I am reminded of the teaching that we as parents or grandparents or friends or teachers carry on with those under our care. That consistent, daily teaching…………and how sometimes we wonder if any of it is sinking into their inner being. Oh yes, it is! So as we continue to live our faith, and teach our children no matter their age, we pray that what they are seeing and learning will reside in their souls and their hearts forever. We pray for our Andrea as she begins graduate school far away in Texas. We pray for Andrew as he finishes his last year of college, that he will seek and know God’s will for his life. We pray for our future with Aaron, for his safety and for our wisdom and patience. Yes, Aaron. After that, we’ll pray. Always pray.